I just found out that my friend Jamie, whom I met when she was probably 8 years old or so, has a blog. Jamie is married to Alan, a pastor who used to be a student in Tom's high school math and science classes. 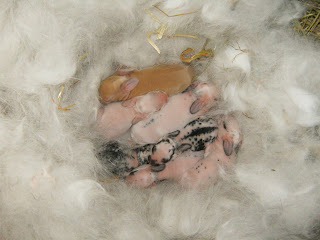 They have 6 of the loveliest children I have ever seen. Watching Jamie and Alan grow in the faith and in love for one another was a lot of fun and gave joy to all who knew them. We were a little late for their wedding, but I got to give the beautiful bride a hug just before she walked down the aisle. Jamie is a well-educated woman and home schools their six children. She has a wonderful sense of humor, and a love for her children that puts me to shame. I think you will find her blog refreshing and uplifting. 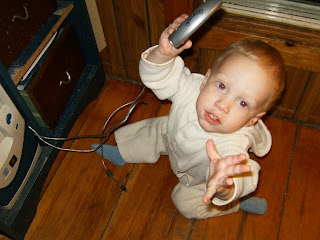 My cousin's daughter, a lovely young lady named Rachel, has started a blog. Check it out here: Lily Among Thorns. It is time we came to an understanding. I have always said that if there is one thing I wish our family could do without, it's the internet. Not e-mail, but the whole rest of the world wide web. There was a time when we did without, and enjoyed ourselves. Can we get there again? Today I sat on the couch and informed my daughter that the old run-down house she wants is up for sale. There I was with Sarah on my right, Elijah on my left, and Tom across from me on the chair. We began a conversation about how we could buy this house for Sarah (we can't but it's a nice dream) and it would be a nice dowry for her. (No, you do NOT hear wedding bells yet, don't even think it.) That led to a discussion about what dowries biblically are meant to be (protection for the bride, and something for her to fall back on in case her hubby died or turned out to be a wife-deserting scumbag) compared to what they became in American history (totally turned over to the husband to enhance his estate, leaving her with nothing if he turned out to be that worthless scumbag). The point of this post is not to discuss the topic of tonight's conversation, but to emphasize the fact that a conversation took place at all. Sarah did NOT have her laptop in her lap, I was NOT on my computer, and NObody had mp3 players plugged into their ears. I was snuggled up with some of my most favorite people in the whole world, just talking. If, in a year or two, you come back here and still don't find anything new, it's because I'm doing something more important: spending time with the people I love the most. P.S. In case you think I'm being extreme, here's a good video to watch: A Journey Home. Set aside 45 minutes of your time to watch this with your family. Seriously. I've been praying for a long time for something similar for our family. Tom hardly ever watches a video with us, but he found this one, watched it, recommended it to me, we watched it with some of our children, then I watched it yesterday with the rest of our children. Acts 7 is Stephen's narration of the history of Israel just before he was put to death by stoning. The chapter makes interesting reading, but I was looking for something I could apply to my life today. When I read any given chapter in the morning, I like to pick out one or two verses to carry with me through the day, verses that give me a sense of the whole passage, or that especially fit what the Lord has already been teaching me. I read over the chapter again, and the "holy ground" verse stood out to me. I live life in bare feet as much as possible. I am the first to go barefoot in spring, and the last to give it up in the fall. The thought came to me this morning that everything I do as a full-time wife and mother is to be holy work. It is to be offered up as worship to my Lord as I try to do everything for His honour and glory. As I went bare foot through my day, hanging clothes on the line, changing diapers, baking bread, wiping noses, reading storybooks, editing something for Tom, giving spelling tests, checking math, supervising chores, and all the rest of it, I kept this thought in my head: "This is holy ground. This is worship. This is for You, Lord Jesus." And anytime I found myself getting impatient or frustrated, I stopped myself by remembering that bad attitudes have no place on holy ground. Abby climbed a spruce tree in our yard to get this picture. The brown is our new roof, with new front porch. Sam, before his haircut. He looks a LOT different now. After the haircut. This is what he plays with when I'm on the computer. It's a multiple USB port, with coffee warmer. 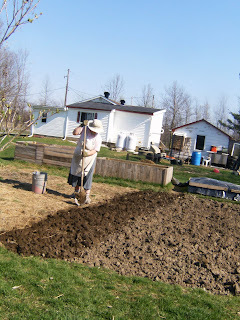 Digging my garden, getting ready to plant the early crops. 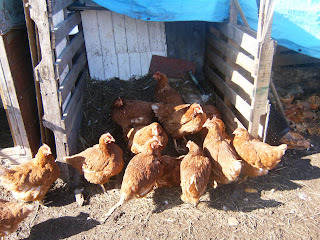 Some of the chickens. They are not as good layers as we've had before, but they're doing okay. 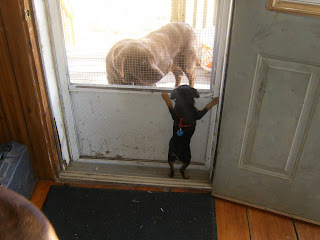 Sarah's little dog, Tomo, saying hi to Snickers, the big dog outside. It's time to get back to blogging. I've been very negligent of it since being on facebook. It's spring! Today I did some more trash clean-up behind the garage and worked in the garden some. The ground is still too wet, and in some places still frozen, to work the soil, but I'm trying to clean things up and get ready. This is going to be a busy summer. We have got to find a better way to grow and store garden produce so that we can actually live off the vegetables instead of having them rot on us. :( We tried storing the pumpkins in the barn last fall, but before I could get them processed, they froze. And the tomatoes didn't ripen before frost, partly because of not having much sun, and partly because I planted them too close together. We're getting the living room redone this year, and installing our new woodstove! The woodstove was a gift from some friends. They had gotten a couple of new ones, so when they heard we wanted to go with wood heat they offered us their old one. We offered to pay for it, but they wouldn't let us. So another thing to do this year is get wood in. And fence in the back third of the property so that the chickens and ducks don't migrate to the neighbours'. And dig a trench to drain the area we hope to fence in. And get my raised beds ready to actually use. And do a major clutter cleaning inside the house. And go on a trip! We are going to Maranatha again this July, and then to a family reunion of sorts. My brother, his new wife, his two sons, and their adopted Papua New Guinea son are coming to the States for a visit. I've never met Johanna, so this is going to be a special time for all of us. I'm also going to get a preview of what life without Sarah will be like someday when she leaves home. She is going to be spending a couple of months with my parents, from mid-April till mid-July. This is going to be fun for her, and I'm glad for her sake, but we are going to miss her. On the days when we are totally bored and there's not much else to do, we will fit in some school work. That probably won't happen much, but I'm thinking we're going to have to do some sort of year-round schooling just to get a year's worth done in a year. 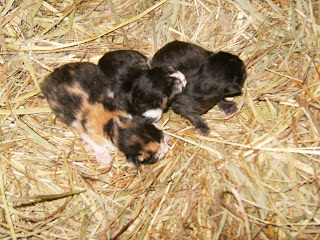 The four youngest have been trying to recover from colds. I let them go outside today since it was so warm and sunny, but I think at least Sam will be staying home from church tomorrow. And now it's time to start supper. Hope you enjoy the reading! And stop by Grace and Truth Books (link on my sidebar) for more fantastic reading material. By the way, I was not surprised at the response for two reasons: one, my blog is not well-known, and two, this is not a popular book. In fact, it is quite a controversial book. But I hope it makes you think and study the Word. Sam, telling me in cheerful, but no uncertain terms, that he is NOT about to eat peas!